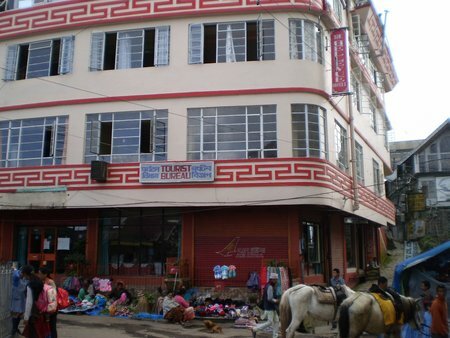 The Bellevue Hotel is a Tibetan family run budget hotel owned by the Pulgers. It's located right on the Chowrasta Mall. A hotel with a similar name Main Olde Bellevue is located behind this one. However that's a different hotel altogether and has nothing to do with this one. The Bellevue Hotel is housed in a three storied building facing the Mall. There are other offices and shops in the same building. The reception area is in the ground floor with an entrance from the right side of the building. Strangely, you can not access the rooms from the reception area. You will need to take a staircase from the back side of the building to access the rooms. The rooms are spread across the two floors above. 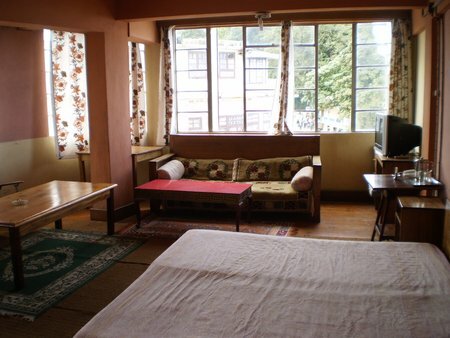 There are standard, deluxe, suites and executive rooms. There are several rooms in the first floor. Some rooms (like room no. 36) are particularly nice considering that they are really large and facing the Mall. This is one of the hotels that provides one of the best views of the Mall and the surrounding area. Below is the picture of the reception area. The polished wooden staircase that you see behind the reception desk gives an impression that it must be leading to the rooms upstairs, so the rooms must be as sleek as the reception area itself. But alas, that's a false stairway and leads nowhere. Actually it ends at the ceiling itself and is there only for show. The approach to the rooms is from the backside of the building and that real staircase is quite a contrast to what you see here. The ground floor reception area is strangely separated and detached from rest of the hotel. The room #36 has a large window that opens out to the Mall below. You can see all the activities in the mall sitting on a sofa laid next to the large window. However a flip side would be the noise during the day time. Mall is the place where most of the tourists gather, children take pony rides, vendors sell all kinds of snacks to people sitting on the benches. So this place is bustling all the time and there will be lots of noise here. The rooms have wood finished floors and are partially carpeted. There are large wooden cupboards provided in the rooms. Room no. 36 in fact has two full size wooden cupboards. There are separate cushioned chairs and wooden tables provided in the rooms where you can have your tea or read the news papers. The rooms have standard TVs with cable channels. Bathrooms are western style, have mosaic floors and tiled walls. There is a counter style wash basin in the bathrooms. Hot water is available in the bathrooms in the morning subject to power availability. 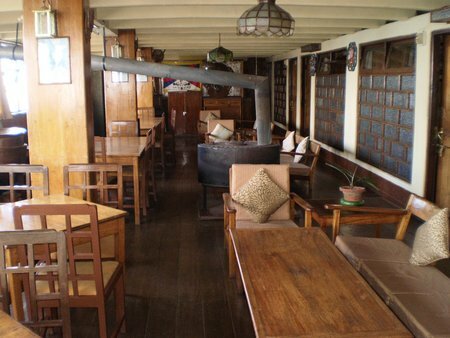 In the second floor there is a large dining space which doubles up as a lounge. It also has a bar at one end. 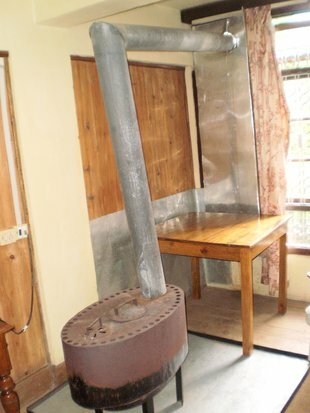 There is a huge chimney fireplace or an wood stove at the center which is lit up with wood logs during the winter. The lounge has several pillars that are covered with plywood. There are several wooden tables and chairs laid out in the room. On one side there are sofas as well. Given the category of the hotel, the overall ambience in the lounge is quite nice. One side of the lounge faces the Mall and has windows opening out to the Mall area. On the other side, there are several rooms lined up that face the back side. Some of the rooms on this floor (like room no. 46) are split up into two parts like a suit. The front part is a small room that has a single bed with a cushioned chair. A door leads to a larger room which is the main bedroom having a queen bed and an attached bathroom. 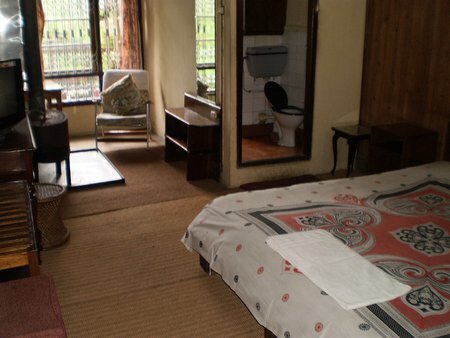 The main bedroom has TV, cushioned chairs and a table, full size mirror etc. These rooms are good for family of three where one person can sleep in the smaller front room and the other two in the main bedroom. The bathroom is similar to the ones in the lower floor. Rooms on the second floor have a special amenity - the chimney fireplace. During the winter, they remove the cover in the burner and place some wood logs that are lit up and then put the cover back on. The smoke is drained out through the chimney pipe and out of the building. Although this is a crude method, the rooms gets warmed up quite quickly. This facility is not available at the large first floor rooms that face the Mall except in one or two cases. The location of the hotel is excellent and right on the Mall. You can get Mall facing rooms or the ones at the back if you want to avoid street noise. Windows from the back rooms open out to a nice garden below. Rooms are large compared to the other hotels in its category. Free Wireless Internet access is available within the hotel premises. This is a lodging only hotel. They do not provide food. However there are plenty of eateries and restaurants in the area. You can ask a waiter to bring food for you. The main negative side of the hotel is its maintenance. Signs of age are glaringly visible all over. The furniture in the rooms are quite old and being worn out. Carpets are faded and wrinkled. Looks like the sofa cushions haven't been replaced for long. The bathrooms are damped and in some of them the taps are broken. 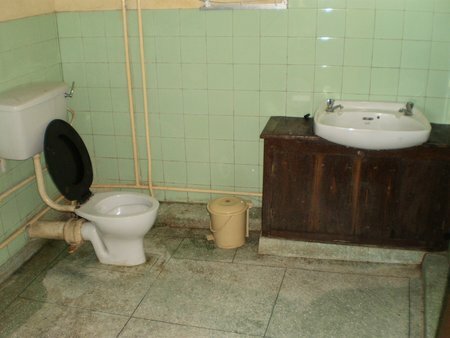 You can't be too finicky about maintenance and cleanliness if you choose this hotel. Overall it's a reasonable choice within budget category, particularly given its location advantage.